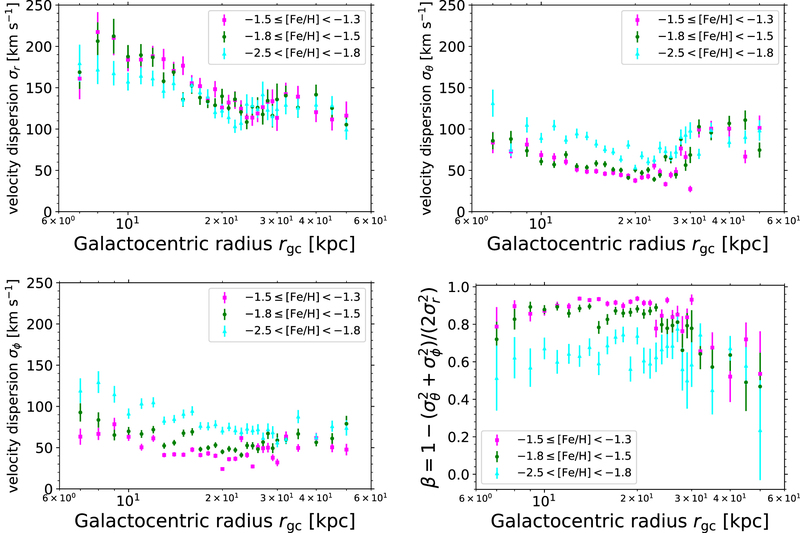 Profiles in Galactocentric radius rgc, of the three velocity dispersion components σr, σθ, and σϕ, and anisotropy parameter β, for three metallicity bins, using our sample of halo K giants after efforts to remove Sagittarius stars as in Figure 5. The top left, top right, and lower left panels show the three dispersion profiles, σr, σθ, and σϕ, respectively, divided into three metallicity bins. The lower right panel shows the anisotropy profile β. 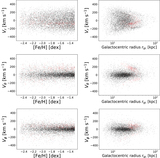 The two more metal-rich bins share a common amplitude of β ≈ 0.9 with rgc < 25 kpc and gradually declining value of β at larger radii. The anisotropy profile is strikingly different for stars with [Fe/H] < −1.8, where the amplitude of β has dropped to ≈0.6 and remains relatively constant out to large radii; such stars are still on quite radial orbits, but substantially less so than the rest of the sample. This change in the underlying velocities used to form β can also be seen in the left-hand panels of Figure 3. 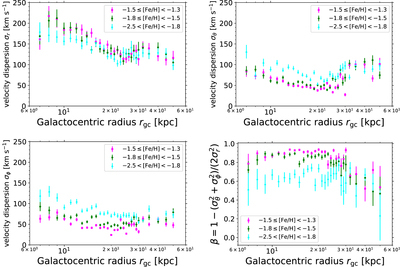 We note that substructure, particularly beyond ≈25 kpc, is still affecting β and the behavior should be regarded with care until careful structure identification and removal is performed.